If you wish to cancel a German train ticket on the day of travel, this must be done directly with the rail operator - either at the station or by following the process below. 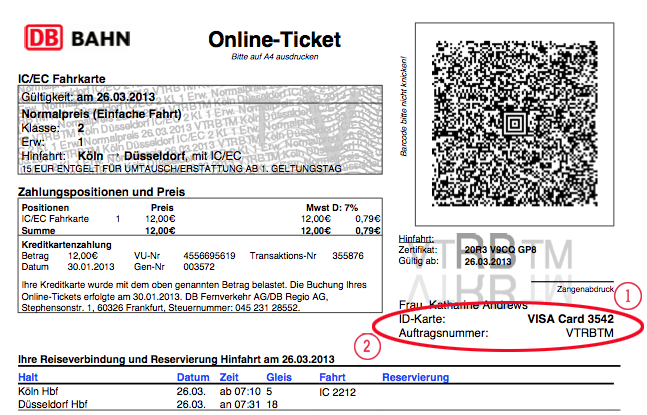 This is the same process for cancelling German tickets after departure if allowed by the fare conditions. Please note that your cancellation policy will vary depending on your specific fare conditions. For cancellations before the day of departure the normal refund process applies. All refunds and cancellations are dependent on the specific fare conditions associated with your tickets and may be subject to a fee. We have two Help articles with more information: Refunding your ticket and Exchanging your ticket. Find your Deutsche Bahn booking number on your ticket/s (note that it is different from your Loco2 booking number, which starts "LO-"). Deutsche Bahn order numbers (Auftragsnummer in German) are typically 6 letters e.g. VTRBTM. Following this link to go to Deutsche Bahn online refund form. Click the ‘request a refund’ button. Enter your details in the space provided then click Search. Once you have reviewed the details of your order, you can proceed to cancellation by pressing the cancel/exchange button in the bottom right-hand corner of the page. If your order incurs a cancellation fee (depending on its specific fare conditions), this will be displayed in the cancellation summary. If you are happy with the information shown on the cancellation summary page, you can confirm the refund by selecting “Execute cancellation".